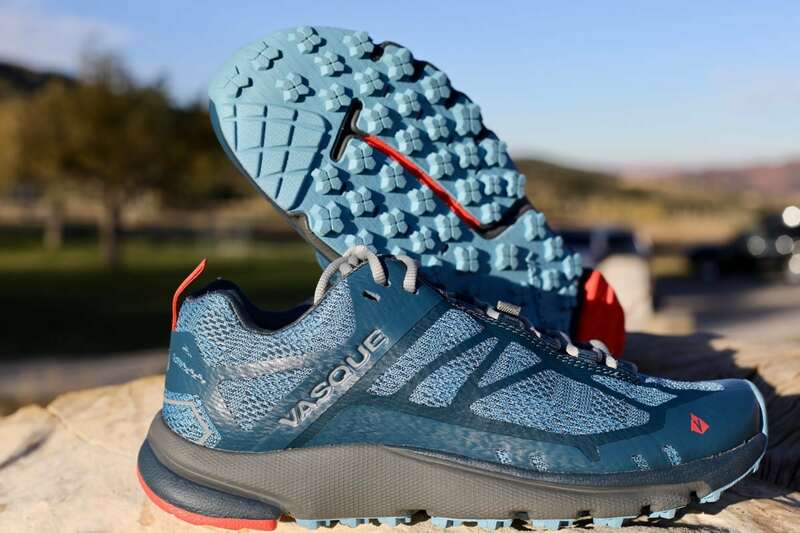 Vasque released their first new trail shoes in several years just last fall, and I’ve been a fan of the Constant Velocity (read my review) since then. 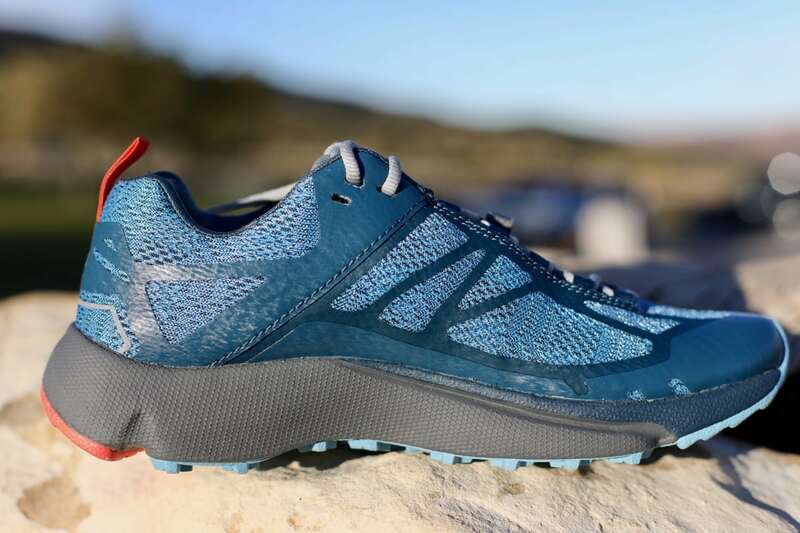 In this year’s Vasque Constant Velocity 2 ($120), updates were made to the mesh and overlays in the upper to enhance the moisture dissipation from the shoe. Interestingly for me, this also results in a slightly different fit and feel in the new shoe. The shoe retains the 8mm drop and relatively svelte 8.7-ounce (women’s 7) and 11-ounce (men’s 9) weight. 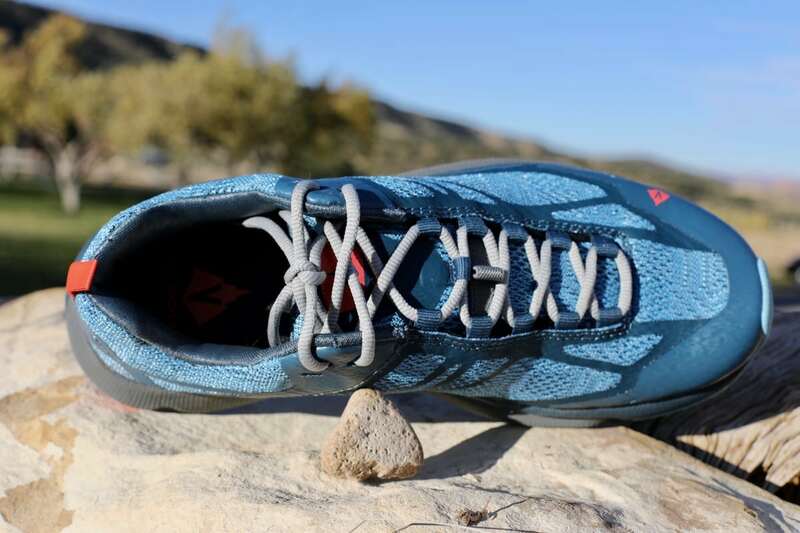 The smooth, cushioned midsole ride and durable outsole remain the same thus ensuring an enjoyable ride on most mild to moderate trails, dirt roads, or even short paved sections. The original Constant Velocity shoe had what I’d call a medium-to-low-profile toebox height that still allowed ample room for my toes. The new upper seems to reduce that toebox height to a low-profile feel, comparatively. So if the previous shoe was a bit too roomy for you up front, the Constant Velocity 2 should be a welcome improvement. In the original Constant Velocity, I comfortably wear a size 9, which is similar to what I wear in Columbia Montrail shoes but a half size larger than Salomon’s trail line and a half size smaller than shoes from inov-8 and La Sportiva. Because of the truly low-profile toebox of the new Constant Velocity 2, I think a women’s 9.5 would be optimal for my feet. The upper is constructed with a new mesh, which has a variegated pattern of larger and smaller holes. It does feel more breathable when a breeze kicks up. The overlays are narrower and more flexible around the upper but in roughly the same pattern. In the heel, the overlays there are now the same as the rest of the upper, which makes the lightly reinforced heel cup more pliable overall. I was pleased with the moisture management of the old mesh and overlays, but I do feel like these drain a bit better simply because there’s more exposed surface area of mesh available to move the moisture. Interestingly, I never found I was taking on more debris. Webbing loops still guide the laces in all but the most proximal holes (reinforced with overlays here), and the same secure, round laces are employed. The tongue is now gusseted nearly all the way which, to me, is an improvement as well. No longer does the tongue slide sideways, which it occasionally did in the original version of the shoe. The ankle collar seems to have more padding in the Constant Velocity 2, which certainly adds to the comfort of the shoe on most surfaces. I experienced no slippage at all in the heel regardless of the inclines or declines I experimented with. The Achilles notch remains very comfortable and sits a bit lower compared to some trail shoes, which I appreciate. I’ve been trying to figure out how the toebox lost some of its volume since there’s no obvious changes to the shape of the shoe in any other way. I think it might come from the increased coverage of the protective rand that extends up over the first, third, fourth, and fifth toes more prominently in the Constant Velocity 2. It’s not a significantly firm rand—rather it feels like multiple layers of the supple overlay material—but it eliminates flexibility the mesh would normally have across the toes thus reducing my foot’s ability to splay out as easily. I might be more sensitive to this than someone with a lower-volume or less-wide forefoot, but it simply means I prefer a half size larger in this year’s version of the shoe. The Vasque Constant Velocity 2 lateral upper. I love this unchanged midsole for its dense, non-boggy cushioned feel whether on trails or doing the one-mile door-to-trail commute on the local paved bike path. The compression-molded EnduraLast EVA supports the Ortholite High-Rebound Performance footbed perfectly and takes the edge off the gravitational forces quite nicely. I’m a fan of the ESS rock plate as well because it’s completely unobtrusive except for the fact that nothing—rocks, roots, random prickly-pear cactus spines—jabs my feet on our rubble-strewn trails. It allows a smooth heel-to-toe transition for me as I cruise the mostly hard-packed rocky routes in my area. The outsole of the Constant Velocity appears unchanged with the same multidirectional lug pattern, smooth-transitioning heel crash pad, and cutouts for adaptability to changing terrain. 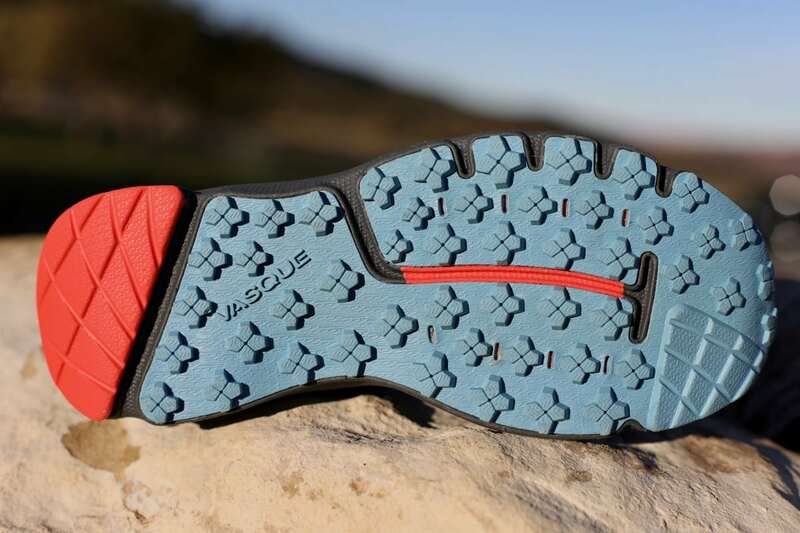 Once again, Vasque’s AxisGrip rubber compound is used in the Traction Plus Sole, which provides excellent grip and durability on mild to moderate terrain in a wide range of conditions. I continue to enjoy these shoes on most of the dry, dusty trails in the Front Range of Colorado, whether they are strewn with rocks or buffed out and flowy. Slabby slickrock and damp roots are well within the functional range of this outsole also, and I was continually impressed by the overall protection they offered. The Vasque Constant Velocity 2 outsole. If it’s dense, responsive cushioning, a low-profile toebox, and an otherwise smooth ride you seek, the Constant Velocity 2 is definitely something to try. It’s a shoe that would feel amazing in the later miles of a longer ultra or in a shorter race right from the ‘3-2-1-GO!’ I’m glad to have this shoe in my rotation. 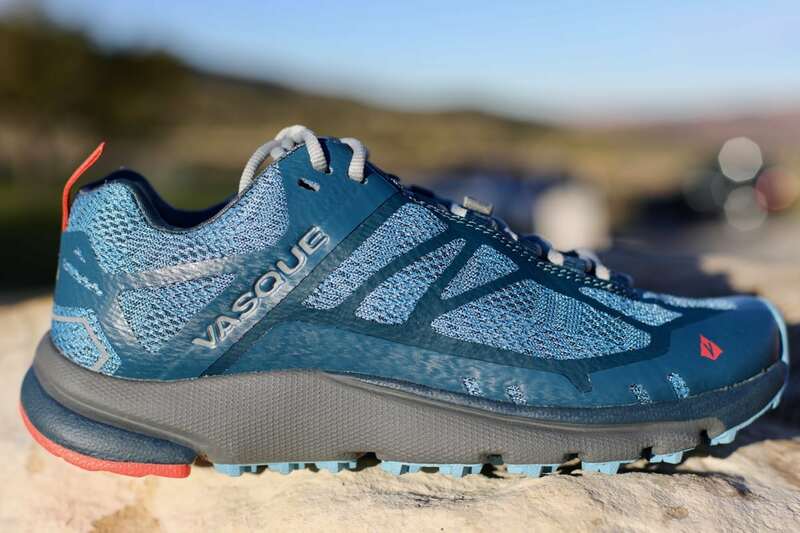 Have you tried the Vasque Constant Velocity 2? Have you tried this shoe’s second iteration after running it the first version? What do you think about the updates made to version 2? The Vasque Constant Velocity 2 viewed from the top. I tried on the first version and found the heel cup to be way too sloppy for my narrow heels, so didn’t purchase. Which is a shame as I think if it fit me I would really like it. Do you notice any difference in the heel? This version 2 seemed more padded to me and fit more snugly. I didn’t have issues with the first, however, and still have them… much thinner feeling through the heel w version 1 but they have a ton of miles on them now. Thanks for this detailed review! It helped me buy them (Velocity 2) online with confidence, and they’ve been great. Your size comparison to inov-8’s helped, as I have a pair, so I ended up getting the right size. And I’ve moved to a location that has a trail I can run from home that’s mostly dirt single track plus a rutted and graveled road, with a half-mile on paved road to get there (and at the end). Your mention of how it does on pavement helped a lot, my inov-8’s wouldn’t be comfortable on a road. These shoes are really perfect for that combination. And–I stumbled on this on the 4th of July, and REI had them for half-price. The stars were aligned. They’re just a little heavy and clunky, no surprise there, but not like running in boots.